"CONTRA LA DICTADURA PINTAREMOS HASTA EL CIELO!" It's Spanish for: "we'll paint against dictatorship until we reach heaven". Wherever you could read that slogan meant that the BRP (Brigada Ramona Parra) had been there with their murals. To talk about the BRP is to go back quite a few years. It began in the 1940's during one of the worst periods of Chilean politics. There was a general strike, and of course with that, came protest on the downtown streets of Santiago, the capital of Chile. During that protest, a young woman named Ramona Parra was shot to death. As a member of the JJCC (Chilean Communist Youth League), Ramona became a martyr symbol of the Chilean struggle against oppression. Her name was proudly taken to identify this artistic movement. This brigade operated illegaly (most of the time) filling the street walls of Santiago with art and political propaganda demanding the acomplishment of human rights. In 1970 when the UP (Popular Unity) government of Salvador Allende came to power,. 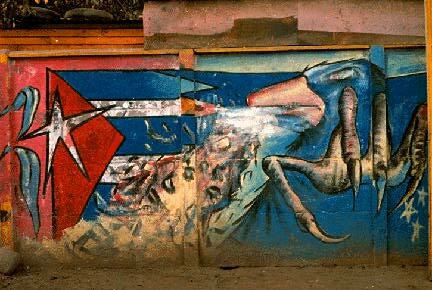 the BRP quickly began to mass produce murals throughout Chile. It was now legal to decorate those pale street walls. The movement suffered a huge blow in 1973. The fascist military overthrew the democratic government, persecuting and eliminating anyone who opposed them. For many years, the bloodshed of thousands of Chileans covered the streets of this country. In the mid 1980's murals started to appear. It was a new generation of young artists, the ones who had never felt democracy. With their brushes and spray cans they began to contradict the military regime. It was in the late 1980's when the "Coordinadora de Murales" (Muralist Coordinador) was formed to organize all the different muralist groups that needed an official representation. The BRP was of course part of the "Coordinadora". Chile was preparing for a plebiscite, and a mass political campaign started from both sides: the "Yes" which was backed by the military and the rich, and the "No" side that was represented by the opposition parties and underground political movements. It was clear that the muralist movement had contributed tremendously towards the "No" victory in October of 1988. The streets of Chile were filled with No slogans. Murals became a normal sight and so was the acceptance of the general public. I remember reading on the walls "...podran cortar las flores pero no podran evitar la primavera...", it means they can cut the flowers, but they can't avoid spring from coming. That's exactly what occurred in Chile, today you can still appreciate popular art that is expressed through the ever lasting gigantic dimensions of murals.